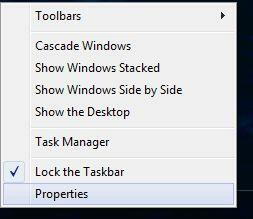 First, right click on the taskbar and select Properties from the right click menu. If you are using Windows 10, right click on the taskbar and select Settings. Scroll down and click on the link which says: Select which icons appear on the taskbar. Alternatively, you can go to the Control Panel and type the word 'taskbar' in the search box from the upper-right side. 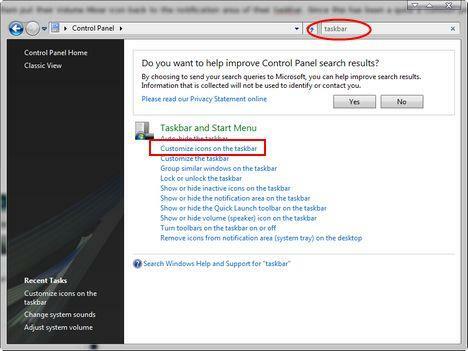 Once the search results are loaded, click on the link that says 'Customize icons on the taskbar'. The Taskbar and Start Menu Properties window will show up on your screen. Here, go to the tab called Notification Area. 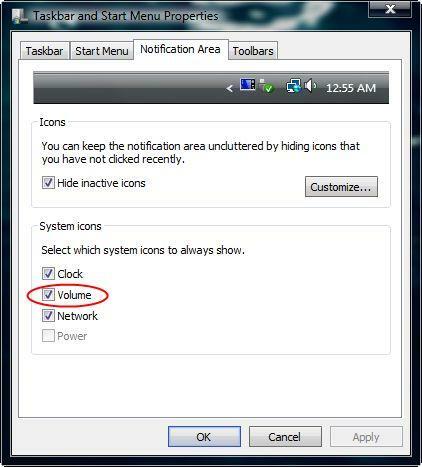 In the System icons section check the Volume box and click on OK. The Volume Mixer icon will now show up in the notification area of your taskbar. I had the same problem i followed the intructions given but couldn't have the option to click on volume icon. Please could u help. I tried all of the other suggestions and nothing worked until I found your solution, Brad. YOU ARE THE MAN! trying to get the volume, network and power mini icons back in my tray but there locked and i cant mark them. why is this??? hey dude .. i saw the tutorial it was great but theres one small problem ... when i see the volume thing and i click on it nothing happens no check or anything ..... idk what happened please help ? i checked this out b4 but it was unable check ,but now its suddenly appeared thnx a lot anyway! How about Microsoft be consistent and also put a shortcut/link to the volume mixer in the start menu ? I think it was in accessories/multimedia, even just accessories would be nice. go to microsoft support and search for fix 50229. My solution to this issue..
My solution to this issue.. always works for me. Right click on your taskbar and select Task Manager. Find in the list explorer.exe (this may also be iexplorer.exe) and end the process. Next, click on the Applications tab. Click on New Task. Type in explorer.exe and press OK. Woo, got my volume checkbox back! "Control Panel--> Hardware and Sound--> Change System Sounds--> Sound Scheme ( Dropdown Menu )--> Windows Default Scheme--> Apply--> OK--> Shut Down--> Right Click on Taskbar--> Properties--> Notification Area--> CHECK AWAY!!!!!" Thanks for posting this solution! The original solution didn't work for me because the Volume box in my Notification Area was grayed out and I couldn't check it. I had the same problem with my computer with the volume icon missing on the toolbar, try to get it back on there but the volume option was grayed out too..very frustrating. Don't know too much about computers but ran scan on my computer and went back to see if I can get the icon back on the toolbar and this time I was able to. So maybe that might work? I couldn't get it to show for my life, I tried hiting the volume but it appeared gone, like when I tried to check it, I couldn't. So I accidently hit the MUTE button and although the Audio Icon is still gone I got sound again!!! Because I have Windows 10 I found nothing to help me so I just did my own detective work. This is what I had to do for Windows 10. I right clicked on the taskbar, then I clicked on 'Settings' which is at the very bottom of the list. 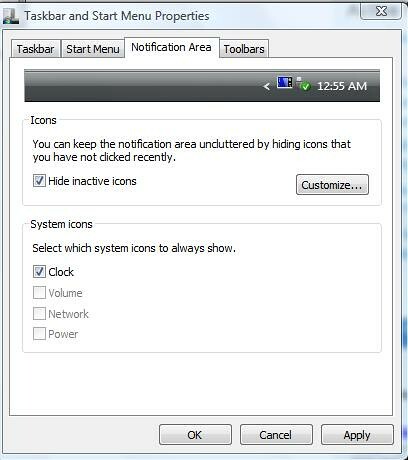 In the small window that popped up I clicked on 'taskbar', then I scrolled down to where it says, 'Notification Area', underneath it says, 'select which icons appear on the taskbar'. Scroll down until you see where it says 'Volume Icon' and switch it on. Voila! Now it is showing on my taskbar! All the instructions for Windows 10 tells you to click on 'Properties. In my Windows 10 taskbar there is no 'Properties'. That's what confused me. 'I'm glad I did my own detective work.